Alcoholics have ruled Russia in the past, but for the first time in Russian history a producer of alcohol, a winemaker, is running for president in the March election. Boris Titov, owner of Abrau-Durso whose shares are listed on the Moscow stock exchange, is careful to avoid speaking to the voters about what he knows best. If elected president, is Titov intending to make alcohol cheaper, or more expensive, he was asked ahead of the launch of his campaign last month. Does he propose to raise or lower the price of beer, wine and vodka by increasing or cutting state excise taxes? Titov replied through a spokesman: “He will not discuss alcohol taxes. 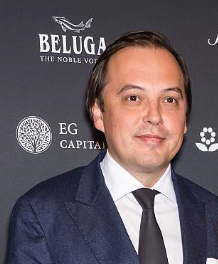 There are no plans concerning alcohol regulation in his programme.” Supporting him, and one of the advisors to Titov’s “Party of Growth”, is Alexander Mechetin, owner of the Beluga vodka brand, and one of the four vodka oligarchs who dominate the Russian vodka market (lead image, 1st left; to right, Rustam Tariko; Andrei Strelets; Vasily Anisimov). The reason for their sensitivity isn’t political. On current polling of Russian voter choice, Titov will be lucky to draw one percent of the vote on March 18. There isn’t a temperance constituency in Russia to appeal to. Promising heavier taxes on alcohol will upset poor drinkers, hurt legal producers, and encourage an increase in the tax-evading trade in samogon (moonshine) and alcohol substitutes, which cause alcohol poisoning. Titov and Mechetin, like the other commercial alcohol producers, as well as the Republic of Tatarstan, currently the biggest volume producer of vodka in the country, say they want the alcohol market to stabilize at the current level of tax, while they produce and sell more alcohol domestically, as well as to the international vodka market. They are looking to the federal government to use police methods to crack down on illegal, untaxed alcohol plants, while motivating regions like Tartarstan to deter the illegal trade by keeping in the region as much of the tax as they can collect. Titov the winemaker isn’t going to spill the vodka bottle. Nor will any other candidate for the Russian presidency. The reason is an ancient one. When Russians drink vodka they are buying intoxication from the state, and repaying the cost of state rule. Drunks make domestic violence, not revolutions. For the vodka drinker and for the state, this has been a reciprocal arrangement from early to late tsarist times, through the Soviet period, as well as the decade of Boris Yeltsin’s presidency. “Vodka Politics”, a history of Russian vodka by American academic Mark Schrad, reports “the rapid expansion of the early Muscovite state occurred simultaneously with the harnessing of vodka’s unmatched revenue potential…vodka has been the keystone of state finance.” In the 18th and 19th centuries, alcohol revenues constituted a third of state revenues, according to Schrad; in the Soviet period, about one-quarter. The privatization of the state vodka monopoly by the Yeltsin regime failed to collect tax, stimulating instead a black market producing more than half of all the vodka sold. Left: President Boris Yeltsin in Berlin, May 1994. Right: Finance Minister Alexei Kudrin, May 2011. Taxing vodka is now, and for the first time, not a significant revenue source for the Russian state, analysts of the Russian alcohol market explain. 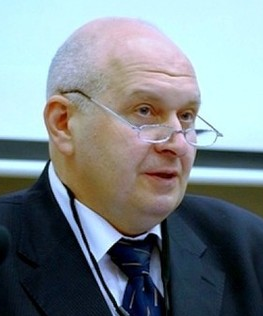 According to Vadim Drobiz, head of the Moscow Centre for Federal and Regional Alcohol Markets (TsIFRRA), state taxes from vodka were about Rb150 billion ($2.5 billion) in 2016; about Rb190 billion in 2017, and they are projected by the Finance Ministry at Rb200 billion for this year. As a proportion of total state revenues, this now amounts to less than 1%. Although experts differ in their calculation of the tax collected from vodka, all now agree the tax value will remain stable through 2019. As other tax revenues grow, the proportion contributed by vodka will dwindle. The black market is being squeezed out of the shops, Drobiz says, by enforcement of the existing tax, not by trying to raise the tax. “The reason is EGAIS. The illegal vodka is leaving the shops.” EGAIS stands for Unified State Automated Information System. Unless bottled alcohol carries a valid EGAIS code (pictured below), it can’t be sold legally. When first introduced a decade ago, the system wasn’t equipped to work properly. EGAIS was then extended to cover, not only the production and importation of alcohol, but also the point of retail sale. In practice, the computer system processing the excise sticker codes on bottles can malfunction, causing sales to stop. This is how the system continues to fail today. However, Drobiz and other analysts of the vodka market believe the relative size of the black market is falling. Consumption of vodka is also dropping in overall volume, Drobiz adds, because of a contraction in the male age group over 30 which has been the largest per-capita consumer in the past. This is a major change in Russia’s vodka history, though not according to Schrad. In his assessment, “the time-tested pattern of financial interests trumping the wellbeing of Russian society is primed to repeat itself again”. Shrad is personally hostile to President Vladimir Putin, and accuses him of allowing his policy on reducing vodka consumption to be “hijacked” by the vodka oligarchs. According to the TsIFFRA reports, four men dominate the vodka market. In addition to Mechetin, they are Rustam Tariko of the Roust group; Andrei Strelets and his Alcohol Siberian Group; and Vasily Anisimov, who has combined the Kristall and Status vodka assets. Left to right, the vodka oligarchs and their brands: Rustam Tariko (Russian Standard); Andrei Strelets (Five Lakes); Vasily Anisimov (Kristall, Putinka). None has ever been received on official business at the Kremlin, and only one, Anisimov, has attended one of the annual oligarch dinners. Anisimov was on Putin’s dinner guest –list in December 2014, but omitted subsequently. Anisimov’s business in metals and real estate has been more valuable than his vodka business; for details, read the backfile. In March 2014 Anisimov paid the €120 million bail imposed by a Vienna, Austria, court to release Dmitry Firtash from arrest on a US extradition application, according to one of Firtash’s US lawyers. In January 2016 Anisimov also met Putin as president of the Russian Judo Federation and a financial sponsor of the Olympic judo team. Collectively, the vodka owners’ interests in lobbying for government action are represented by the Moscow-based Union of Producers of Alcohol Products (SPAP). SPAP and Strelets claim credit for successfully lobbying the Kremlin to freeze the excise tax on vodka between 2014 and 2016; for details, click. Mechetin’s Beluga Group (formerly Synergy) and Tariko’s Roust produce audited public accounts; Strelets and Anisimov own private companies which are closed financially. In 2015 and 2016 Beluga was showing a steady increase in revenues, as well as profits. In the latest Beluga report for the first half of 2017, revenues were off 2%, but net profit doubled to Rb229 million. Roust was lossmaking in 2014, 2015 and 2016, and is in a New York court-supervised reorganization of its obligations and assets. However, Tariko’s 2017 quarterly financial reports indicate a 29% growth in sales to June 30, 2017, and a profit jump to $139 million. By Russian oligarch standards, the revenues and profits earned by these vodka producers are minuscule. How stable are their shares of the Russian vodka market, and is it accurate to say the producers have hijacked Kremlin policy? 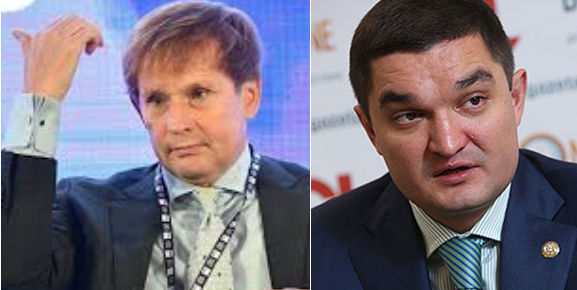 Left: Boris Titov launched his “Party of Growth” election campaign on December 21, 2017. Source: http://sputnikimages.com/hier_rubric/photo/3261928.html Right: in 2012 Titov was appointed by Putin as Commissioner for Entrepreneurs’ Rights, and every year since then, Titov has met the President to deliver the annual report of his office. Pictured above, right, was their most recent meeting on May 26, 2017. Market share estimates, based on the reported production of vodka and sales, vary between the sources. Altogether, the Federal State Statistics Service (Rosstat) data for production in 2016 suggest Mechetin has a 13% share of market volume; Tariko, 10%; Anisimov, 9%; and Strelets, 5%. Because the retail prices vary and their brands are targeted at different consumer income levels, their market share percentages differ for value. Vodka value in the Russian market is more the consequence of price than a precondition. Mechetin, for example, has admitted in this interview that he finds it difficult himself to taste the difference between high-price (premium) and low-price vodka brands. At the low-price end of the market, Anisimov’s group claims to have a market share of 17%, well ahead of the other names; Anisimov’s brands include Dobry Medved (Kind Bear), Staraya Marka (Old Mark), and Putinka (Little Putin). At the high-price end of the market, Tariko claims to be ahead of the others with his Russian Standard brand (38%). On the other hand, Strelets’ Pyat Ozer (Five Lakes) brand claims to have been the most popular premium vodka brand since 2012. For the popularity contest between Russian vodka and other brands in export markets, read this. Most of the high-price Russian brands suffered a significant setback in sales between 2014 and 2015; but the low-price Russian brands entered the international market for the first time. Their sales volume turned out to be 50% greater than the volume lost by the premium brands, suggesting that the negative sentiment of middle-class American drinkers towards Russia wasn’t as potent as the lure of discount pricing. Unnoticed in the American claim that Putin’s vodka policy favours the oligarchs is the regional politics of vodka production. 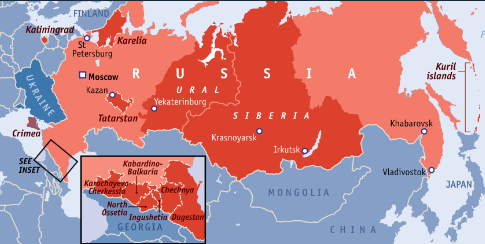 This has shifted dramatically from the Caucasus to the Volga region — from Kabardin-Balkaria, which had been turning out large untaxed volumes, to Tatarstan, which has made taxing its own production company a significant source of local revenue, in effect subsidizing Tatarstan vodka to gain market share nationwide – at the expense of the vodka oligarchs. Although the Tatar republic created its alcohol enterprise Tatspirtprom in 1997, it was not until 2004 that the republican government decided to boost the enterprise, replace the black and gray markets, and give locally distilled and branded vodka a price advantage over other competitors. The rise of Tatar vodka is credited to the political rise of Rustam Minnikhanov, who was prime minister of the republic between 1998 and 2010, under President Mintimer Shaimiev. When the Kremlin ousted Shaimiev in 2010, Minnikhanov replaced him. He then directed new investment, marketing and taxing policy for the vodka business, and the rise of the Tatar brand, Russkaya Valuta (Russian Currency) began. By the end of 2016 this was the leading domestic brand of vodka by volume of sales. Revenues for Tatspirtprom reached Rb44 billion that year; tax payments to the regional and federal treasuries were almost Rb29 billion – just over half to the treasury in Moscow, and the balance to Kazan. By volume, in 2016 Tatspirtprom turned out 12.4 million decalitres, 17% of the countrywide total recorded by Rosstat of 73.2 decalitres. Left: Minnikhanov drinking tea with Putin, June 2017. Right: Russian Currency vodka, red and premium blue label. The commercial competition reacted during 2017. By mid-year SPAP, the commercial lobby organization in Moscow, formally charged Tatspirtprom and Minnikhanov’s government of violating Russia’s competition laws by fixing prices to keep rivals out of the republic; and beating them for sales in the rest of the country by offering retailers much larger rebates. In effect, what the Tatars were doing was promoting Russian Currency and other local brands by undercutting the price of rivals; and compensating for the loss of manufacturer’s margin by the large volume of excise tax the republic’s treasury was able to take. “As a result of protectionism the products of Tatspirtprom get undue price advantage over the rest of the vodkas,” the head of SPAP, Dmitry Dobrov, told the press. A Federal Antimonopoly Service (FAS) investigation was opened and then closed for lack of evidence. A parallel investigation by the alcohol market regulator, the Federal Service for Alcohol Market Regulation (Rosalkogolregulirovanie, RAR) was requested by the Anisimov group. RAR said the issue of price rigging wasn’t within its jurisdiction, and referred the case against Tatar vodka to FAS. Industry sources have told the press they believe that Anisimov, whose distilleries have included several in Kabardin-Balkaria, won’t get far against Tatspirtprom, not least of all because a substantial volume of the Tatar production is secretly contracted for sale to rival commercial groups like Tariko’s and Mechetin’s. A more serious threat to Tatar vodka has been a move by the federal Finance Ministry to take a larger share than the 50/50 split of the excise tax proceeds in effect through last year. However, the attempt to legislate a 100% federal excise tax has so far failed to pass. Left: Igor Kosarev, Vice President of Russian Standard Corporation. Right: Irek Minnakhmetov, chief executive of Tatspirtprom. “Our main competitor,” the head of Tatspirtprom, Irek Minnakhmetov (above, right) says, “is the illegal manufacturer. For counterfeiting should be punished as strictly as drugs and gambling, because it’s criminals killing people.” This alliance between the vodka oligarchs and Tatarstan proved during 2017 that it is more powerful than Kudrin’s old ministry in Moscow. It’s a force that Putin will not upset, nor Titov challenge in his election campaign.